Electric longboards are finally getting to that level where it’s attractive to purchase one for your commute. The Linky longboard has a handy folding mechanism, goes a long distance on a single charge and is durable, even in bad weather conditions. 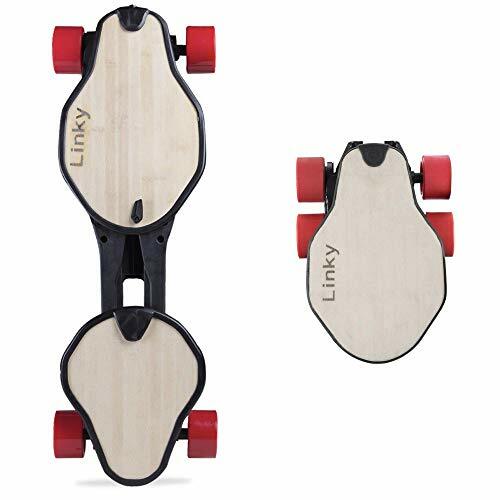 The Linky longboard was initially funded on Indiegogo back in 2016 and has ran a successful campaign, earning close to $300,000. Its onboard motor packs quite a bit of power, allowing a person up to 100kg to reach speeds up to 18.6 mph (30km/h). It’s powerful enough to take a 12% incline. The fast charger that’s available separately, allows you to get an 85% charge in 30 minutes. The battery on the Linky board also recharges when you brake, so going downhill gets you some extra distance when you take it easy. Now you may think that with all these specs you’ll get a heavyweight board that needs a weightlifter to carry it around conveniently. Well, it’s among the lightest electric longboards on the market, weighing only 12.1 pounds. The Linky Electric Longboard is still available via Indiegogo’s InDemand program, but now also ships via Amazon. You can get it in the regular edition with a bamboo deck, or get the slightly more expensive all-black carbon-look edition. FOLDING: Linky 32inch Electrical skateboard for adults designed in Italy for a unique dynamic performance. The patented folding mechanism makes it fast and easy to extend and compress Linky and put it in the backpack or bag. LIGHT and STURDY: With a weight of 12.1 pounds Linky is amongst the lightest of the electric longboard market. The structure is made of high strength polymers from the automotive industry instead of heavier metal parts.